I’m sure my colleagues and I will long remember the unplanned events of December 9th. You might remember that we had rain that day. Quite a bit of it. I arrived early in anticipation of emptying buckets, and found the toilets clogged. I called the plumber, who told me it was the cesspool. I protested that it couldn’t be the cesspool, as I’d recently had it pumped, until I remembered that all that rain, in a feat of plumbing no doubt innovative in 1910, travels via pipes from our flat roof, right down through the building, and into our cesspool. Before the cesspool folks arrived, the rainwater had backed up and flooded the bathroom. And the backroom had a new leak, with no bucket underneath it, and the back room flooded. And then the furnace wouldn’t work. And the rain had swollen the outer door so that it wouldn’t lock properly. 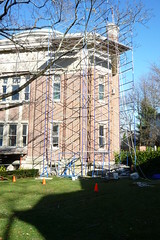 And right about that time a truckload of scaffolding was delivered. 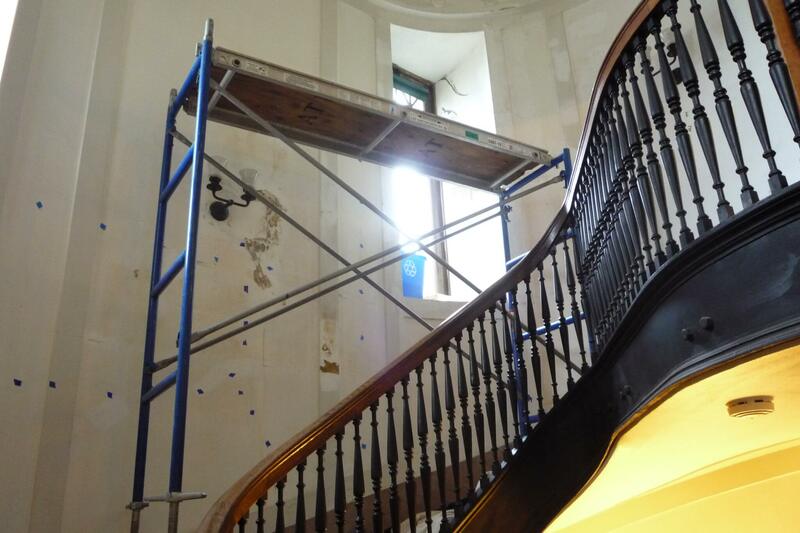 That scaffolding, erected along the southeast corner of the library, and on the stairs to the third floor, will be used to facilitate thermal-imaging and exploratory probes of the building to determine the nature and condition of the structure. The data collected will eventually be used to help us correct all those plumbing and heating problems (not that we didn’t have fun that day). These photos were taken on December 10th, after the deluge had ended. It’s all true, with no exaggeration!!!! I was there as a witness. Cathy, you are a true hero for weathering all those trials and tribulations.